So if you aren't gluten-free, go ahead and use regular panko bread crumbs. If the cheese isn't a problem for you, use your favorite cheese. I recommend swiss cheese, but havarti, provolone, or monterey jack would also work well. Lay a chicken breast flat on a cutting board. Slice it horizontally into two thinner pieces. Repeat for the other three breasts. Flatten each chicken breast by pounding it with a meat hammer or a rolling pin. You want them fairly thin. Lay a slice of ham and cheese on each breast piece. Roll it up with the ham and cheese on the inside. Use a toothpick to hold the rolls closed. Beat the egg with 1 T. of water. Bread the chicken rolls by dipping them into the egg, then into the bread crumbs. If you use croutons, no need to add extra seasonings. Otherwise, you can add 1/2 t. of oregano or sage to the bread crumbs. Place seam side down in a greased baking dish. Bake at 375° for 20-30 minutes, until chicken is no longer pink and breading is nice and crispy. Sprinkle with parsley. Makes 8 servings - size depends on how big the chicken breasts were to start with. This is a story of the little garden in my backyard. It produces tons of veggies and fruits. My husband was in charge of planting it this year so we ended up with an interesting mix that wasn't what I had planned but it's okay. My husband is a casual gardener. He weeds maybe once a month when the weeds get higher than the veggies or he convinces me to go out with him. My husband also believes in letting volunteer squash and tomatoes grow. Many of the varieties you plant are hybrids, so when they cross-pollinate, you get some very weird varieties. We got red pear tomatoes one year and teeny tiny red cherry tomatoes another. This year, we have some weird squash. Tasty, but weird. They look like zucchini, sort of. We just picked one that looks like a zucchini shaped acorn squash. Can't wait to cut into it to see what it tastes like. Others are a cross between delicata and zucchini. Mild tasting and less wet than zucchini, they worked great in zucchini bread and stir fry. We also have these - tigger melons. They're about baseball size and taste a lot like a honeydew except not quite as sweet. 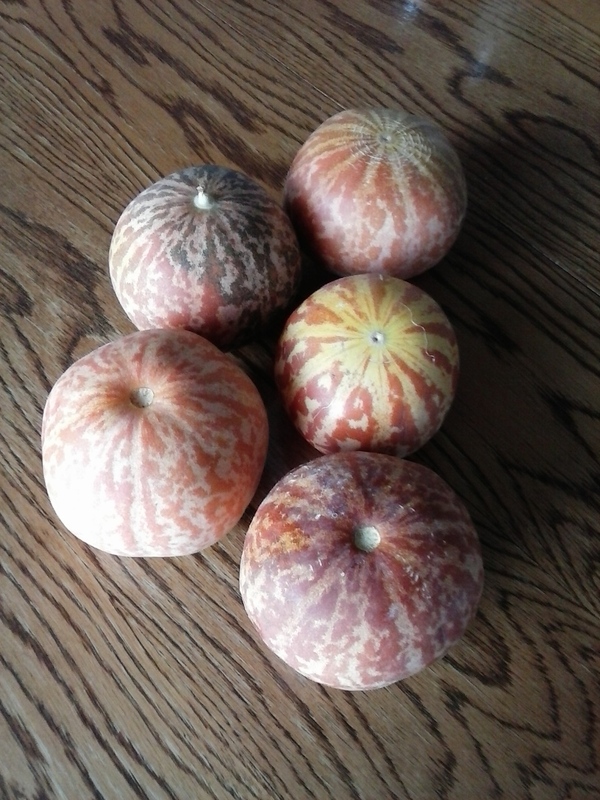 They're an heirloom variety of muskmelon. Maybe next year I'll plant my flowerbed of okra that I wanted to do this year. What weird fruits or veggies have you tried that are not the normal stuff? Did it grow well for you? What did you do with it? I'd love recipes or other fun stuff. Now to get back to making tigger melon jam. New experiment for me. I'll do a recipe post on it if it turns out. I glanced up from my video game. "Why do you ask?" My daughter shrugged. "They always talk about them on Food Network. I just wondered what they were." "Poached eggs on toast with ham and hollandaise sauce." "That sounds delicious. Can we make them?" I thought about it for a minute. "Not tonight. I don't have any ham." We finally have ham, eggs, and all the rest of the ingredients so we tried it. Verdict is Eggs Benedict are delicious but they make a humungous pile of dirty dishes. And they aren't quite as simple as they look on tv. Fry the ham until it's hot. Fry eggs over easy - whites set and yolks runny. Each person gets to assemble their own - Place toast on plate, top with ham then cheese. Gently place the egg on top. Drizzle some hollandaise over, then sprinkle with green onions. Eat with a fork and knife. It gets really messy, but it's delicious. Melt butter in a small saucepan over med-low heat. Keep cooking it until it is nice and hot but not browning or burning. If it starts to boil, you've gone way too far. Dump egg yolks into a blender. Add lemon juice, salt, and tabasco. Blend on low just until mixed well. Turn speed up to med-low. Drizzle hot butter into the blender while it's running. Let it blend for about 15 seconds after you finish adding the butter. Refrigerate any leftovers. Don't try to reheat it or it separates. Try using a spoonful on top of fish when you serve it. Or spoon a dollop on top of steamed asparagus or broccoli. It's got a great lemon-butter taste. Since I'm struggling writing new stuff other than short stories, I'm working on other venues and ideas. Here's an update, in case you're interested. First off, I'm working on my health issues. They've gotten so bad lately that I'm having a hard time getting anything done other than binge watching Netflix and playing too many online games. If it requires brainpower or energy, it usually isn't going to get very far. But hopefully, I'm finally with the right specialist and on the right medications. I'll know within a couple of months. It's hard being a one-person publishing house, even if the only author is me. It takes more energy and time than you'd think to get things published and out there for you to read, even if I'm not trying to write it, too. Second, I'm working on getting my backlog out in audio. It's a struggle. I found a narrator I loved, but she's not doing books any more. So I found another one. She's pretty good. I hope she'll do the rest of the Altairan Empire series. Meanwhile, I'm working on getting other books and stories out there, but the narrators are hard to come by. I've had a couple of them flake out on me. Third, I'm writing short stories to publish. Slowly. Mostly getting rejections so I'm working on another short story collection. I've got enough of a backlist, new stories as well as ones published in various anthologies and magazines, to fill a new volume. Fourth, I'm toying with the idea of cookbooks. If there's enough interest, I'll collect all my recipes to date and put them together in a cookbook. Downside is that my current publishing options don't handle cookbooks well. I want spiral bound and coated paper. Plus I need to get some nice food photos taken, not my usual barf-on-a-cookie-sheet look. So, shout out in the comments if you want a printed cookbook. I can also do ebook cookbooks easily enough, if that's more your style. Let me know what you are interested in and I'll make it happen. Eventually. Fifth, I'm crocheting like a mad woman. And selling yarn stuff at cons. It makes more money than my books. Speaking of money, I spend two afternoons a week teaching piano. It's a great part-time job, but it takes a lot of my limited amount of energy. Between that and my own kids, I'm exhausted most days. 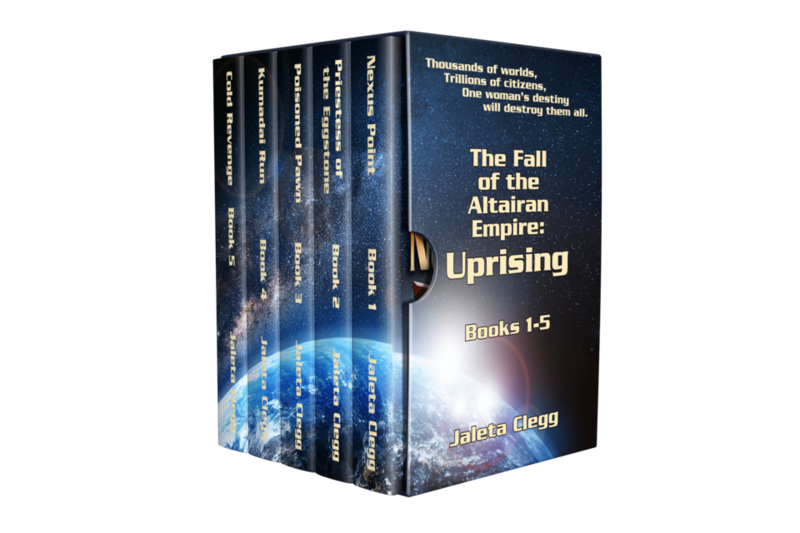 And the last bit of news, I'm putting all of my Altairan Empire books into two ebook bundles. The first bundle is on sale here and includes books 1-5. If you already own all the books, THANK YOU! If not, here's your chance to get them all for a great price. I'm also working on a collection of my short stories set in that universe. I've got several more to write first. So, how's your life going? I have a pile of fresh peaches. And I want peach ice cream. I can't find any at the store. So I'll just have to make my own. And since I'm going to the effort of making it from scratch, I may as well make some that my daughter can enjoy too. 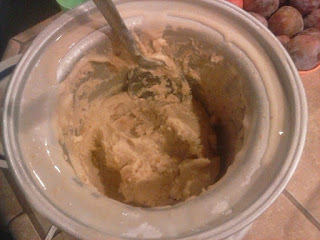 So here's to dairy-free, fresh peach ice cream! Whisk the egg yolks and honey together in a large metal mixing bowl OR the top of a double boiler. Beat for at least one minute - you want them well combined. Set aside. Fill a saucepan or the bottom of the double boiler with hot water and bring it to a simmer over medium heat. Stir the coconut milk and almond milk together in a small saucepan. Add the cinnamon stick. Cook over medium heat just until it comes to a boil. Remove the cinnamon stick and discard. Stir a little of the hot milk into the egg yolk mixture. Beat well. Add the hot milk a little at a time until all of it has been stirred into the egg yolks. Place the bowl or double boiler over the simmering water. Cook and stir just until it thickens and coats a spoon, about 185°F or about 10-15 minutes. Remove from heat and let cool. Pour into a covered container and refrigerate at least three hours. Process the custard in your ice cream maker according to directions. When it starts to freeze up, add in the peaches. Let it finish processing. Enjoy as soft serve, or freeze for later. 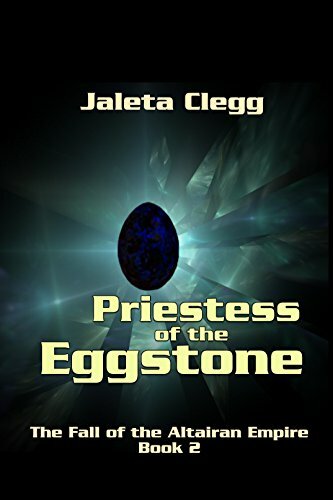 Priestess of the Eggstone is finally finished. We're just waiting on ACX to approve it. I am like a duck. I'll explain that in a moment. 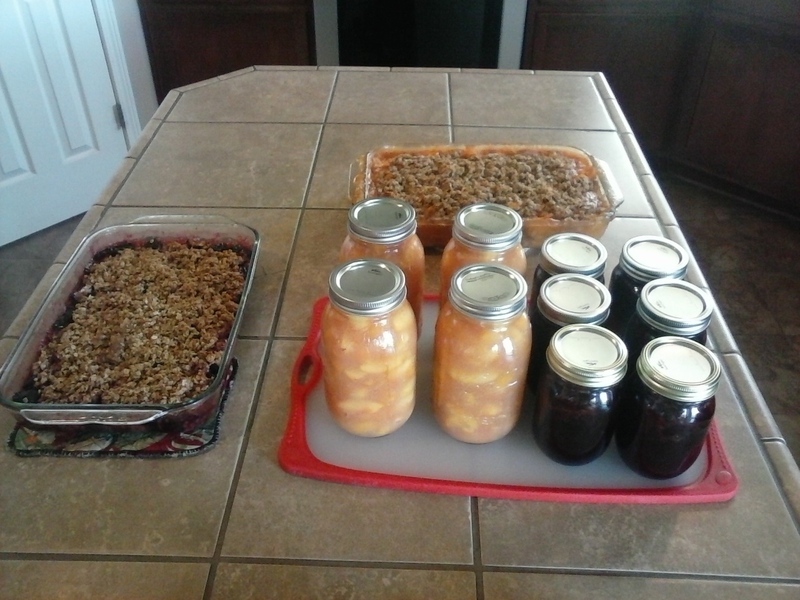 That's a nectarine cobbler, a plum cobbler, four quarts of nectarine pie filling, and six pints of plum jam. It took most of the morning. What you DON'T see is the enormous pile of dirty dishes doing this generated. Several large bowls for holding fruit in various stages of being peeled, chopped, sliced, mixed, and processed. A giant pot that got rinsed out and reused several times. Big spoons. Knives. Measuring cups. Cutting boards. My canning funnel. Lots of dishes. Looking at the picture, it doesn't seem like it should have taken that much time to produce so little. How much time and effort should it take to make a pint of jam? Honestly, how much do you think? 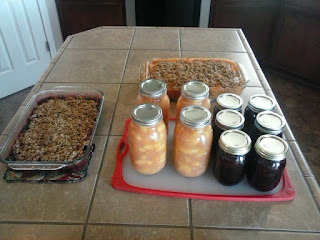 Those who have made jams and jellies and canned fruit and made cobblers from fresh fruit know how much effort it takes to process fruit. This was just two big bowls, one of nectarines and one of plums. That's 3-4 hours worth of work on the counter. It won't take nearly that long to eat it. All of it. Writing is very similar. Hours and hours and hours of work goes into something you can read in an afternoon. And now to explain the title of this post. Watch a duck on the water sometime. They look so serene as they glide along. But if you could dive underneath and watch them from that angle, their little feet and legs are going like crazy. It takes a lot of work to look that calm. Sometimes, we're the momma ducks, who just need to kick water a little to glide across the pond. Sometimes, we're the baby ducks, paddling for all we're worth just to stay in position. And sometimes we're just really really grateful we have children who will wash that mound of dirty dishes we just created.